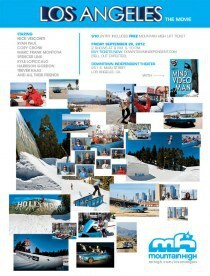 Mountain High - Mountain High Set To Premiere New Movie "Los Angeles"
Mountain High Set To Premiere New Movie "Los Angeles"
Mountain High Resort is proud to announce the premiere of its first ever full-length snowboard movie titled, Los Angeles. This special engagement takes place on Friday, September 28, 2012 at the Downtown Independent Theater in Los Angeles with Think Thank’s Mind The Video Man. There will be showings at both 8pm & 10pm, and movie goers are encouraged to buy tickets ahead of time at downtownindependent.com as the venue will sell out. Tickets are just $10 if purchased by September 23, 2012 ($15 after) and each movie goer receives a FREE Mountain High midweek lift ticket at the door. If you live in the greater Los Angeles area whether that be in Venice, Malibu, Beverly Hills, Hollywood, Downtown, East LA or more, then Mountain High is in your backyard and it's just a short drive to the snow. This movie follows the new Mountain High pro team on an insanely fun season with wild times and proper tricks at one of the best terrain parks in the nation. Mountain High's first feature film is directed by Matt Devino, produced by Brad Farmer, and stars Cory Cronk, Kyle Lopiccolo, Spencer Link, Harrison Gordon, Trever Haas, Nick Visconti, Ryan Paul, Marc Frank Montoya, and many of their friends including Trevor Jacob, Scott Blum, Jussi Oksanen, Ian Thorley, Mitch Richmond, Ian Sams, Jager Bailey and Yale Cousino just to name a few. "Mind The Video Man" explores progressive freestyle snowboarding with those in the vanguard and those about to make their mark, while asking the question, "What's happening with the snowboard video, where is it going next and how will that impact our culture?" Follow the video man and his crew as they push the limits of possibility and progression through creativity in an attempt to create something of meaning that will stand the new media onslaught and the test of time. Mind the video, man. Think Thank's 9th snowboard movie features Jesse Burtner, Scott Stevens, Ryan Paul, Ted Borland, Sean Black, Brandon Reis, Brandon Hammid, Nial Romanek, Chris Beresford, Sam Hulbert, Jaeger Bailey, Kyle Lopiccolo, Curtis Woodman and many more. 2 Showings - 8 p.m. and 10 p.m.